Some soldiers on Monday, 24th July 2017 subjected prospective National Service personnel in Accra to severe beatings. The sad incident, which took place at the National Service Secretariat office in Accra, the LADMA Annex, where the personnel had gathered to confirm their registration into the 2017 scheme. 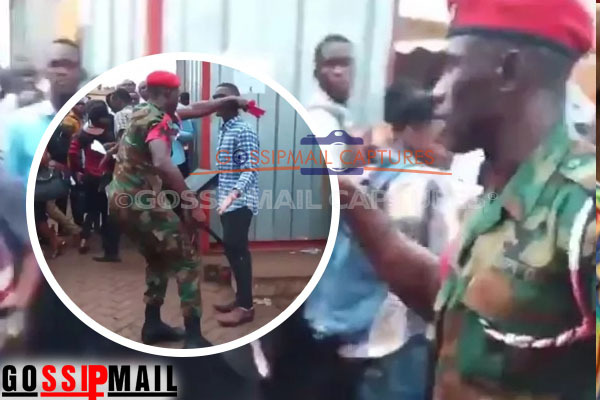 According to reports, the Military officers had intervened in a bid to calm the chaotic nature of the queue in front of the office. Over the years, the NSS registration has been marked with long queues and minor disturbances with some places like Accra reporting over 400 people already queued as at 4:00AM. As usual, the first day of the 2017 National Service registration had a very rocky start as things got out of hand at the registration centers during the registration. The soldiers used sticks, belts and batons to strike the personnel. A lady was said to have bled profusely from a blow reportedly struck by one of the military officers on her head. The secretariat, however, has assured registrants that more receiving points would be made at the various registration centers in hopes of preventing past subsequent activities, yesterday’s debacle as well as any future occurrences. The manual registration of the National Service Registration has been a constant process since time immemorial and many are wondering how we are in a digital age yet cannot make any decent progress of registering online.